Another scam artist caught pretending to represent a major airline has been hit with a huge judgment. This time, it’s a Florida businessman who has been ordered to pay $6 million for using Delta Air Lines’ name and logo to lure victims into buying bogus vacation packages. In 2015 Delta accused Douglas Mark Fletcher and three other individuals of international trademark infringement by using the airline’s logo to market a number of allegedly fraudulent travel planning companies. According to the lawsuit [PDF], Fletcher ran several travel-related businesses with names like Full Moon Travel, Tours R Us Special Vacations, BookItDiscountClub.com, Twilight Travel,and Destiney Marketing Services. 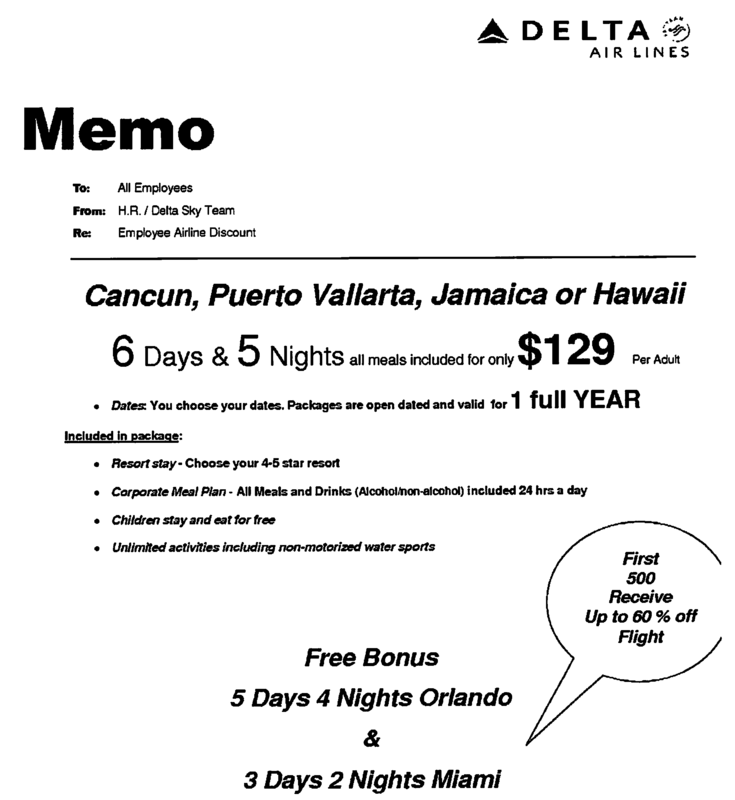 Without Delta’s permission, Fletcher used the airline’s logo in promotional faxes (see one example at right) that offered a variety of promotional vacation packages for sale. The promotional faxes were sent to businesses, the lawsuit claims, and presented in a way that made it appear as if they were sent by or approved by the airline. Delta claims that the companies used its logo to lure responding recipients into purchasing expensive vacation perception, which were in reality worthless. For example, the flyers claimed to come from “H.R.” or “Delta Sky Team,” and prominently displayed the Delta name, logo, and SkyTeam marks in an identical way as they appear on the airline’s website. The recipient was then directed to call “booking and reservations” and provide a reservation code to take advantage of the supposed deal. Delta noted in the lawsuit that it received complaints regarding the faxes from third parties. In some cases, Delta claims its own employees received the flyers. Wednesday’s judgment [PDF] is just the latest multimillion-dollar penalty a court has awarded to Delta over travel scammers who impersonated the airlines. In 2014, Delta sued more than a dozen similar grifters, and the airline has since been granted multiple summary judgments against those defendants. Last May, the airline received a $26 million default judgment [PDF] against one group of defendants. A year earlier, a whopping $42 million judgment was ordered [PDF] against seven others accused of deceiving consumers by pretending to be Delta. Whether the airline ever sees a dollar of any of that money remains to be seen, but these lawsuits are more about sending a message that the airline won’t tolerate con artists using its name to defraud people. After all, airlines already have a bad enough reputation.